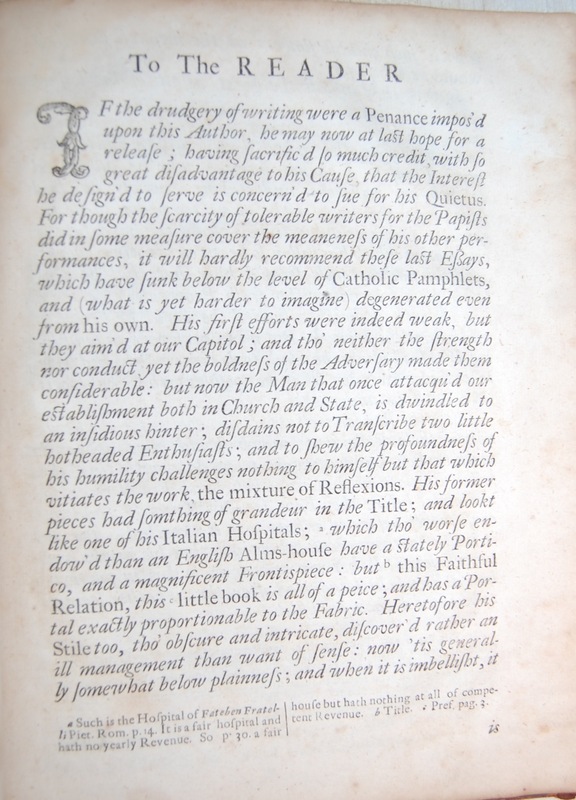 730G The seven authors : ad1) Abraham Woodhead, R. H., 1609-1678.
ad4) Anonymous. By Samuel Parker. ad7) Anonymous. By James Harrington. 5) A discourse concerning the nature of idolatry: in which a late author’s true and onely notion of idolatry is considered and confuted. 6) De ecclesia Romana dissertatio. Pars operis multo majoris de judice controversiarum et Catholicæ veritatis regula. Autore Georgio Ashwello S.S.T.B. ecclesiæ Anglicanæ Presbytero, Coll. Wadhami in Acad. Oxon. olim Socio. 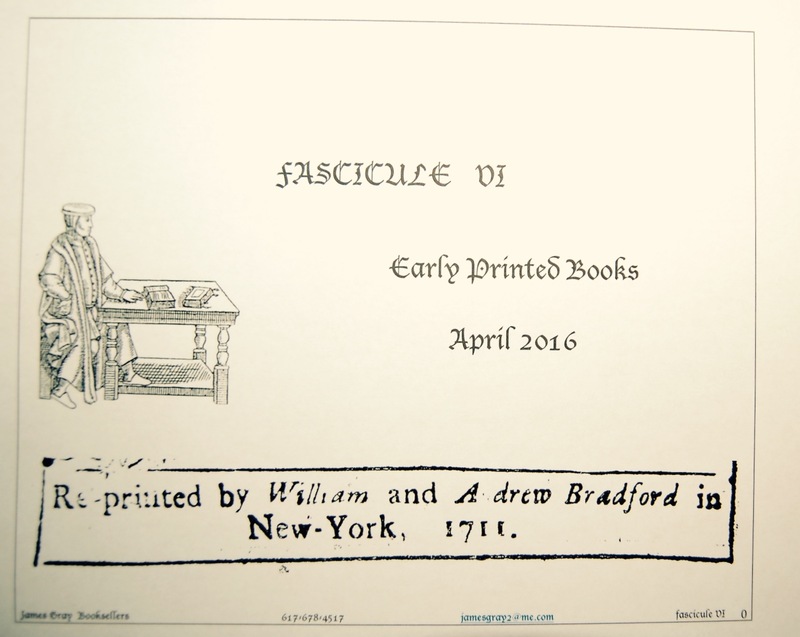 Printers and date printed: ad1) Printed at Oxford : [s.n.]. ad2)Oxford : printed at the Theater, Anno 1687. ad3)Oxford printed at the Theater, for Richard Chiswell at the Rose and Crown in S. Pauls Church Yard, London 1688. ad4) London printed for Henry Bonwicke, at the Red Lyon in St. Paul’s Church-Yard 1688. ad5)London : printed for William Rogers, at the Sun over against St. Dunstan’s Church in Fleet-street, MDCLXXXVIII. . ad6) Oxoniæ : e Theatro Sheldoniano, an. Do. M. DC. LXXXVIII. 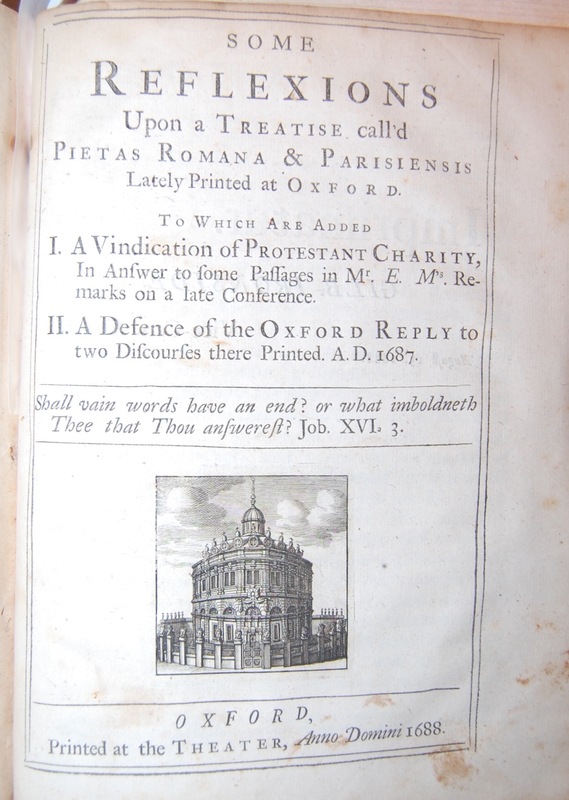 ad7) Oxford: printed at the Theater 1688. Quarto 9 X 7 inches . All seven books are First editions. This copy is bound in full contemporary calf, the front hinge has an early repair, worn. The first Parliament after the Restoration revived the priority of Supremacy and priority which were taken on 14 July, 1660. The Catholics in England being at first in some favour managed, as a rule, to escape taking it. After the conversion of James, then Duke of York, the jealousy of the Protestant party increased, and in 1672 The Test Act was carried by Shaftesbury, which compelled all holders of office under the Crown to make a short “Declaration against Transubstantiation”, viz., to swear that “there is not any transubstantiation in the sacrament of the Lord’s Supper, . . . at or after the consecration thereof by any person whatsoever” This test was effective: James resigned his post of Lord High Admiral. But when the country and the Parliament had gone mad over Oates’s plot, 1678, a much longer and more insulting test was devised, which added a further clause that “The invocation of the virgin Mary, or any Saint and the Sacrifice of the Mass . . . are superstitious and idolatrous . . . and that I make this declaration without any evasion, equivocation, or mental reservation whatsoever, and without any dispensation already granted me by the pope. On the death of Charles, James II succeeded, and he would no doubt have gladly abolished the anti-Catholic oaths altogether. But he never had the opportunity of bringing the project before Parliament. 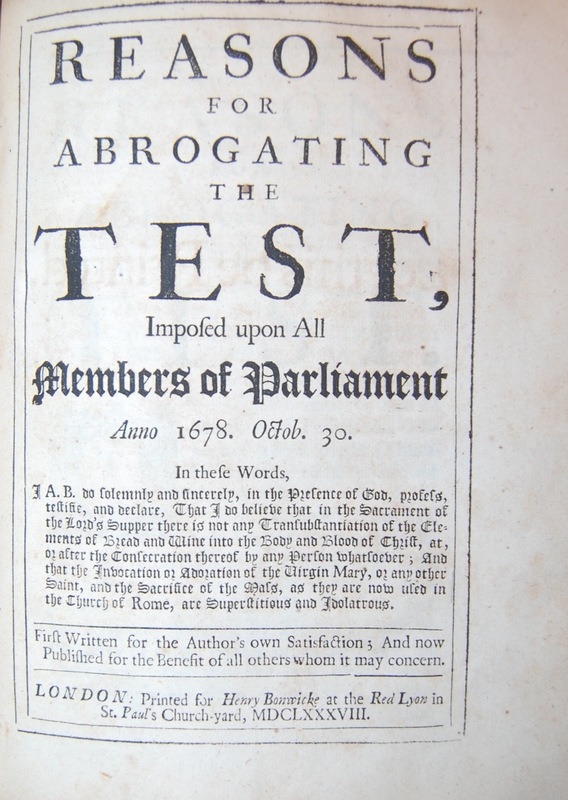 The Test was the subject of constant discussion, And here in this collection of bound books we have more than two sides of the debate, for its form and scope had been expressly intended to hamper a reform such as James was instituting. He freed himself, however, more or less from it by the Dispensing Power, especially after the declaration of the judges, June, 1686, that it was contrary to the principles of the constitution to prevent the Crown from using the services of any of its subjects when they were needed. The first work bound here is by Woodhead whom Dr. Whitby pronounces “the most ingenious and solid writer of the Roman (catholic) party,” and who merits some notice from his name occurring so frequently in the popish controversy at the latter end of the seventeenth century , The attempt of James II to force his creed upon an unwilling university called forth many champions of the faith, and among others the able young tutor of Christ Church. 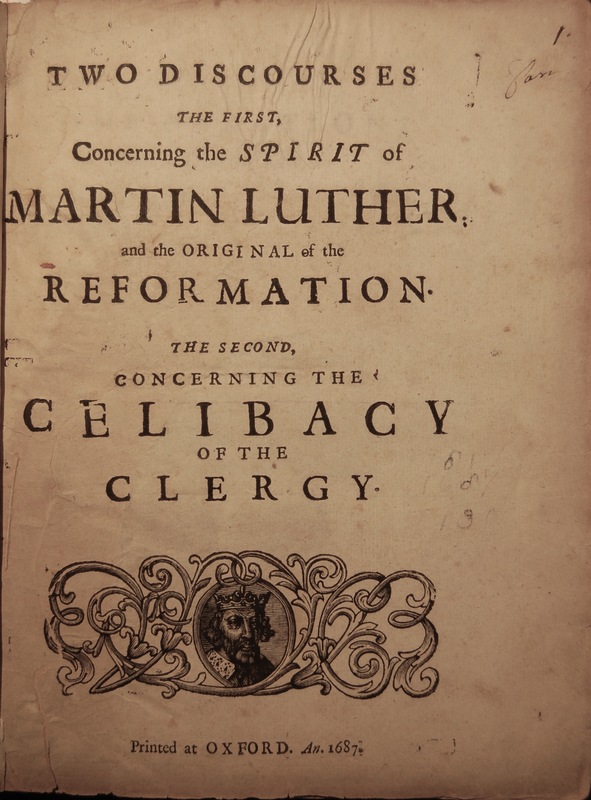 In “Two Discourses,” Abraham Woodhead, launches an attack upon the Reformation in the person of Martin Luther who he accuses of numerous ‘failings’ and extrapolates these failings to be the cause for the invalidity of the Reformation in whole. . 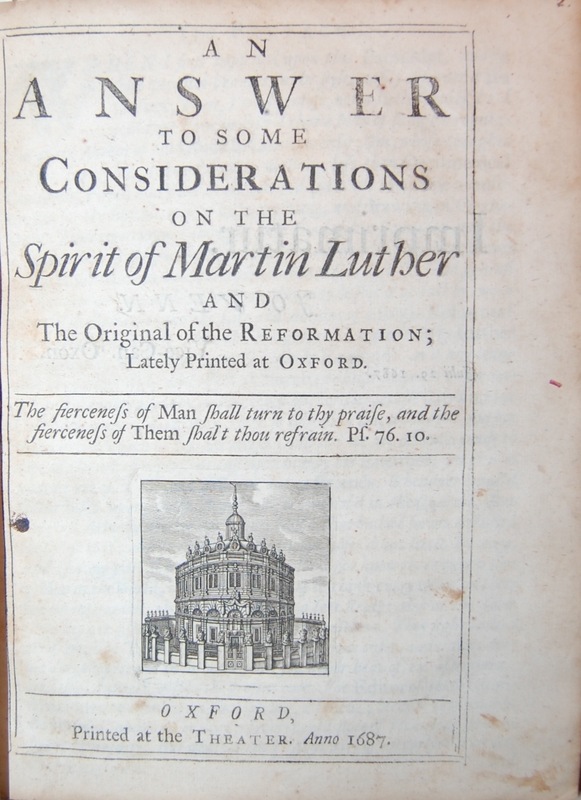 In reply to this Atterbury published (1687) ‘An Answer to some Considerations on the Spirit of Martin Luther, and the Original of the Reformation,’ which Bishop Burnet pronounces to be one of the ablest of the many vindications of the church of England ‘. His Answer to the Discourse on celibacy of the Clergy is also an admirable defence. Bound next is Samuel Parkers’s Reason for Abrogating, which at the time he published it was Bishop of Oxford, but because of the conciliatory nature of the book he was rumored to be a Roman Catholic. 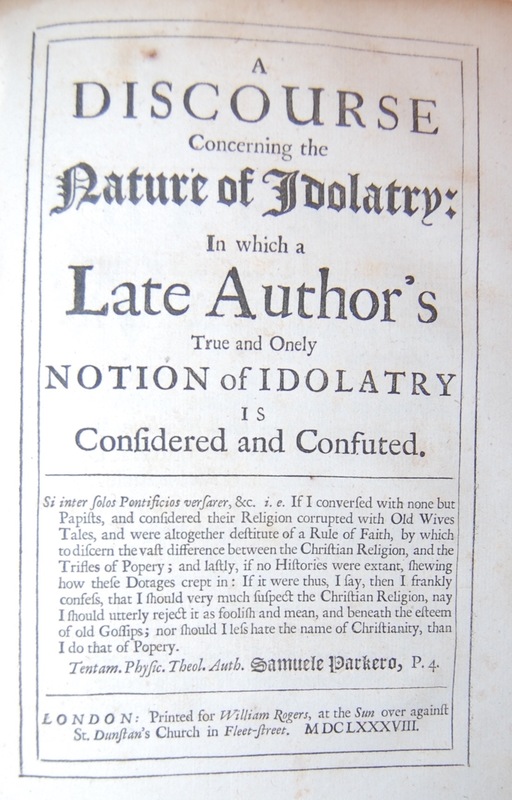 Bound next (5th) is Parkers Discourse concerning Idolartry, in which Parker hopes to convert Papists,. Is an interesting history of Idols and Idolatry . 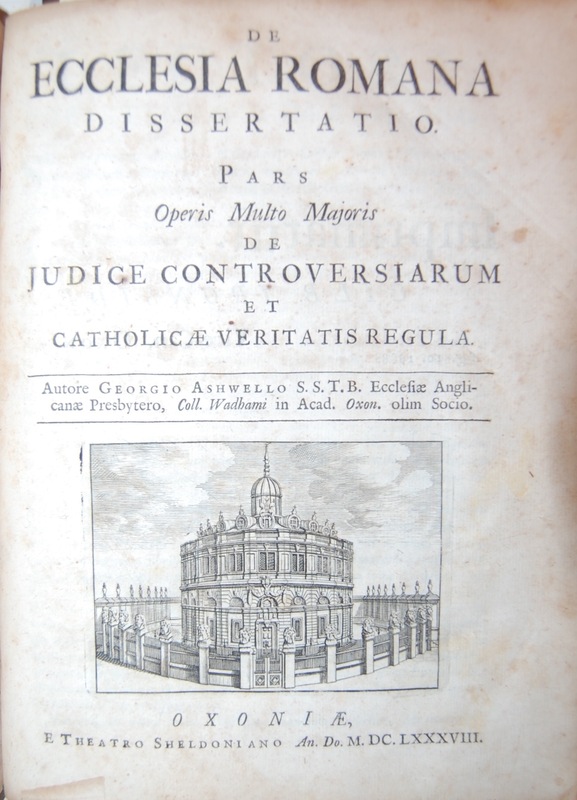 Next we have the only published part of George Ashwell’s “De judice controversiarum et catholicae veritatis regula “ which supports the Anglo-Catholic positions..
Wing: W 3460, A4146, T3235, P467A, W239, A3994, H834.